No, they don’t, but the margarita I ordered a few days ago was surprisingly good. 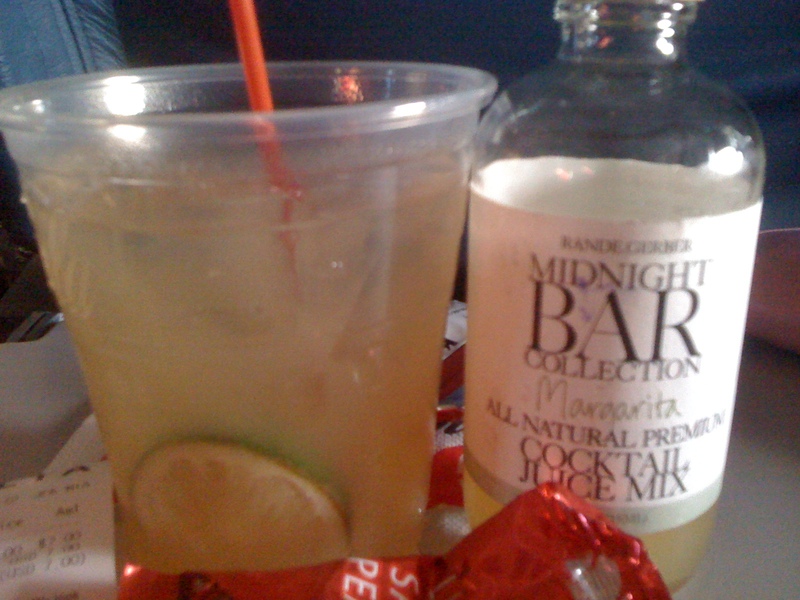 Margarita, with extra mixer and salted peanuts on my tray table. An airplane wonder, at only $7. The cocktail featured Sauza gold and Rande Gerber’s “Midnight Bar Collection” margarita mix, bottled by Stirrings. Gerber, a former model, is married to Cindy Crawford and runs the Midnight Oil/Gerber Group chain of bars and lounges (over 30 properties, including The Whiskey and Stone Rose Lounge in NYC). He developed a line of cocktails for Delta in 2007. This mixer had real lemon, lime and orange juice and was not overly sweet. Shake in an iced cocktail shaker, strain into a large cocktail glass and rim with crusted salt. Haigh traces this cocktail back to 1937, noting the “Brandy Crusta begat the Sidecar Cocktail, which in turn begat the Margarita.” Some recipes will call for lemon instead of lime juice and others will call for triple sec instead of Cointreau. I wouldn’t recommend either of these substitutions. Even more importantly, do not use “sour mix”; fresh citrus juice is always the way to go. So thats what you spent 4 years doing at Cornell!